After a lovely Christmas day with the family, it was off to Vicarage Road to see if we could arrest the recent slump. The Boxing Day game is one of the first that I look for when the fixtures come out. I always look forward to them, even if they rarely give us anything to cheer (I am still smarting from the injury time goal by Kirk Stephens in 1979). I had anticipated traffic and trouble parking but, once I had negotiated the classic car rally in Sarratt, it was plain sailing and I was surprised to be waved into the car park at the West Herts and find it almost empty. Happily, our table was pleasantly populated although, as he likes to make sure he doesn’t miss anything, Don had already made his way to the ground. Team news was that Wagué was to make his first start for the Hornets in place of Prödl. Holebas and Gray also made way for Zeegelaar and Doucouré on their return from suspension. So the starting line-up was Gomes; Janmaat, Wagué, Kabasele, Zeegelaar; Doucouré, Watson; Carrillo, Cleverley, Pereyra; Richarlison. The team selection was described as ‘random’ by one of our party. It was noticeable that there was no striker in the starting XI but, given the lack of end product from the current incumbents, that was an option that had been discussed after the game on Saturday. As we walked along Vicarage Road to the ground, Glenn predicted a 3-1 win. He was feeling a lot more positive than I was. Following the coin toss, the teams swapped ends, an event that is seen by many as a bad omen. But my brother-in-law pointed out that having a female lino usually leads to good fortune, so the omens cancelled each other out. The first fifteen minutes of the game was notable for the three yellow cards that were shown. The first to Leicester’s Maguire, before Watson and Kabasele followed him into the referee’s book. The first goal chance went to the visitors after a slack defensive header by Janmaat was intercepted, Chilwell’s cross was headed goalwards by Okazaki, but Gomes pulled off a flying save, tipping it over the bar. 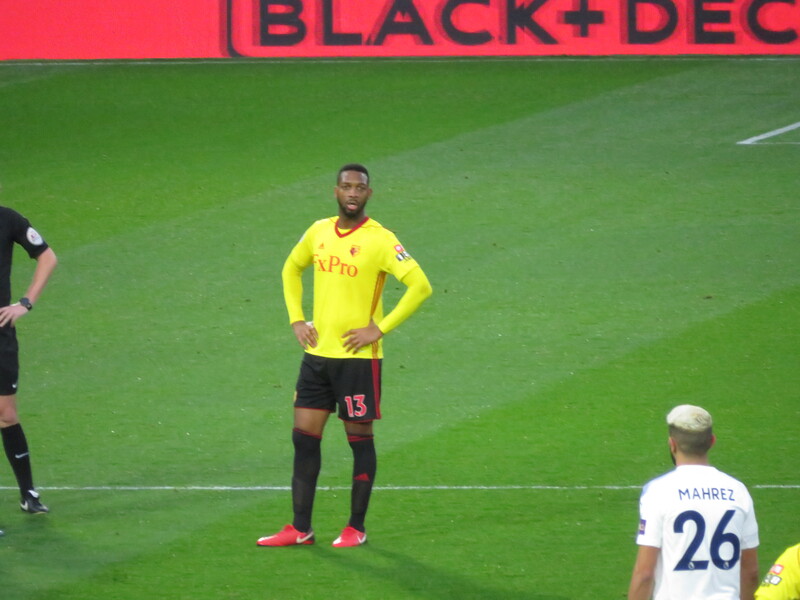 A lovely move by the Hornets saw Carrillo beat a player to get into the box and pull the ball back to Pereyra who tried a back-heel towards the goal which was blocked. Carrillo gave the ball away in midfield allowing Albrighton to release Vardy, who broke forward but, with only Gomes to beat, managed to find the side netting at the near post, much to the relief of the home fans. Watford had a decent chance from a free kick which dropped to Doucouré, but his shot was blocked. The next caution was earned by Dragović, who pulled Pereyra to the ground to stop him escaping. The visitors threatened with a shot from Mahrez which probably looked more dangerous than it was as it flew through a crowd of players who may have unsighted Gomes, so I was relieved to see it nestle in the keeper’s arms. Leicester took the lead in the 37th minute as Albrighton crossed for Mahrez to head past Gomes. It was a sickener as it followed a decent spell of play by the Hornets. After recent set-backs, you could only see one result following, but the Hornets reacted well and should have equalised almost immediately as Carrillo played a lovely through-ball to Richarlison. With only Schmeichel to beat, an instinctive shot would probably have done the job, but the young Brazilian overthought it, delayed the shot and found the side-netting. There was some light relief as a coming together between Pereyra and Ndidi resulted in the Leicester man tumbling over the hoardings. I know that it could have ended in injury, but it always make me laugh and, thankfully, he returned to the field with no harm done. That proved to be the Argentine’s last involvement in the game as he was withdrawn due to a knock and replaced by Okaka. A change that was greeted with approval by the home fans. The Hornets equalised as the clock reached 45 minutes when a corner from Cleverley was met with an overhead kick from Richarlison that was blocked, but it fell to Wagué who finished past Schmeichel. 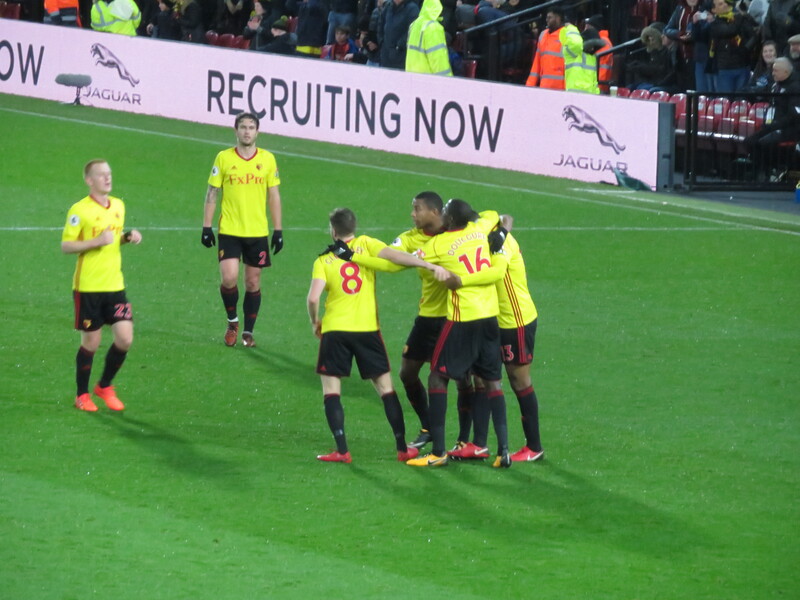 The home side could have taken the lead in time added on at the end of the half as a lovely move finished with Cleverley finding Richarlison on the left of the box, his shot was powerful and cannoned off the post, but it sent the Vicarage Road faithful into the break with smiles on their faces. The guest for the half-time draw was Nigel Gibbs, who commented that he had been home for Christmas earlier than expected after the managerial change at Swansea. It is always lovely to see Gibbsy back at Vicarage Road and, as he approached the Rookery on his way back into the stand, he was given a tremendous reception, which he clearly appreciated. Early in the second half, a lovely ball over the top from Watson reached Richarlison who looked as though he’d escape, but his first touch was too heavy and the chance was gone. The first goal attempt of the second half fell to the home side as Carrillo found Doucouré on the edge of the box, he had time to swap feet and pick his spot, but his shot sailed well over the bar. Leicester had a great chance to regain the lead as a dangerous cross looked as though it would drop nicely for Vardy, but Gomes was first to the ball. At the other end Richarlison found Okaka, who tried an overhead kick which flew wide of the post. A dangerous counter attack by the visitors was foiled as Watson did well to get back and cut out Albrighton’s cross before it reached Vardy. The Hornets took the lead on 65 minutes following a Cleverley free-kick. From our vantage point at the opposite end of the ground, Doucouré’s shot appeared to have been cleared off the line. 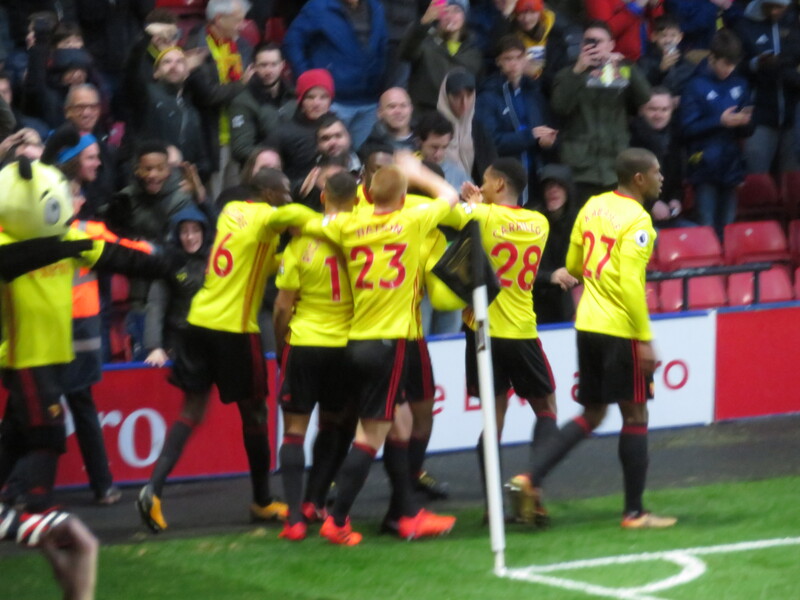 There was a pause as the Watford players claimed the goal, the referee looked at his ‘watch’ and, as I held my breath, pointed to the centre circle, sending the Rookery into wild celebrations. Leicester made two substitutions replacing Okazaki and Dragović with Slimani and Gray. It appeared that Glenn’s score prediction would be spot on as Cleverley robbed Chilwell and advanced on goal, but his shot was just wide of the far post. Puel’s last change saw Ulloa coming on for King. The visitors had a great chance to draw level from a corner as the ball dropped to Morgan, but Gomes did brilliantly to block the shot. The keeper was called into action again from the resultant corner, dropping to save Ulloa’s header, and the danger was averted. Silva made a couple of late substitutions, bringing Prödl on for Watson, followed by Carrillo, who had another great game, making way for Sinclair. I must admit that it was a relief to see only three minutes of added time. There was time for a lovely passing move up the wing which finished with a cross to Okaka, who won a corner and used up some of the remaining seconds. 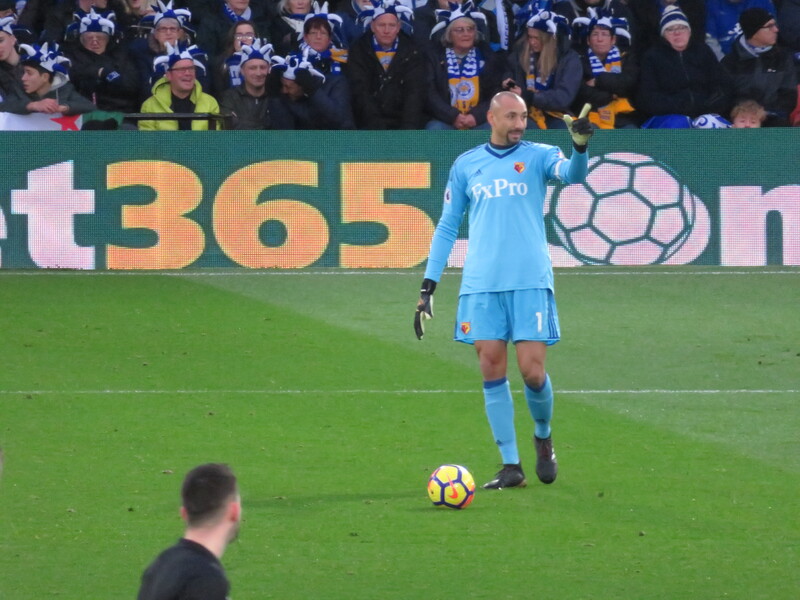 The last action of the game was a cross from Albrighton that was gathered by Gomes under a challenge from Maguire that he did not appreciate, he was raging at both the player and the referee. But he was to end the game with a smile on his face as Watford grabbed a win that was probably deserved based on the quality of the play, if not the tally of shots on target. This game wasn’t perfect by any stretch of the imagination, but it was a pleasing return to some kind of form. Following a couple of lack lustre performances, the work rate that had been such a pleasing aspect of the play in the early part of the season was back, with players pressuring their opponents, giving them no space to play and causing them to make mistakes. Wagué played well on his full debut, topping it off with a goal. What had appeared to be a bit of a makeshift team had given us the best ninety minutes for some time and provided a rather lovely finish to this Christmas. We just need to continue in the same vein against Swansea. This entry was posted in Watford FC and tagged Abdoulaye Doucoure, Aleksandar Dragovic, Andre Carrillo, Andy King, Ben Chilwell, Ben Watson, Christian Kabasele, Claude Puel, Daryl Janmaat, Demarai Gray, Harry Maguire, Heurelho Gomes, Islam Slimani, Jamie Vardy, Jerome Sinclair, Kasper Schmeichel, Leicester City FC, Leonardo Ulloa, Marc Albrighton, Marco Silva, Marvin Zeegelaar, Molla Wague, Richarlison, Riyad Mahrez, Roberto Pereyra, Sebastian Prodl, Shinji Okazaki, Stefano Okaka, Tom Cleverley, Watford FC, Wes Morgan, Wilfred Ndidi on December 27, 2017 by franelynn.